Whether you're a business travel novice or a seasoned professional! If you are working away from home, it is vital to have the perfect environment so that you feel at ease and manage to still retain a good work efficiency. As a first time corporate traveller, the temporary transition to a new area can be difficult and somewhat subconsciously stressful; especially as you are away from your loved ones and in unknown territory. In fact, there is so much subconscious business travel stress that Harvard dedicated huge research into this very topic and created a timeline exampling just that ~ You should take a look at it when you get a moment here. With the above said, we’ve often found from experience that the right apartment to rest your head and relax can make all of the difference – That’s why we’ve decided to create a top 5 checklist of things you may or may not consciously consider when assessing your next stay. Take a look at our top 5 considerations and signs that you have found the perfect corporate apartment for you. First things first, we would be lost without our devices and may have to resort back to MMS – Could it be worse!? Top of our list is internet connectivity and you will soon know that you have found a great apartment when you have everything you need to work effectively. Constant availability of Wi-Fi, as well as a private telephone and desk, are must-haves if you are to work effectively while on your travels – Do not settle for less. If you are new to the area, you’ll want an apartment that is in a prime location and is convenient for you throughout your stay. The last thing you want is an hour commute every morning to a conference or meeting. So, work out where you are going to be spending most of your time, and make sure the location of the apartment is convenient. If you don’t plan to hire a car, you will need an apartment that is on the public transport lines or preferably within the heart of the CBD action. If you feel at home, this is definitely a good sign. It sounds obvious, but you wouldn’t believe how many people choose an apartment on the basis of “oh, it will do” and then two weeks down the line they hate it there. By feeling at home in your apartment, you will find it a lot easier to adjust and it’ll make the time away from your loved ones a little bit easier. Feeling secure wherever you stay is of paramount importance. Ensure that there is a good security system in places, such as swipe key access and a common CCTV area. This is especially important in busy city locations where there may be slightly higher levels of crime. There are also a few small things you can do to keep you and the items inside your apartment safe once you’re in, such as investing in a small safe and ensuring you keep everything locked up – even if you only step out for a moment. You’ll be surprised at how we take security for granted. Last but not least, the price of the apartment is, of course, an important factor. You need to sit down and work out how much money or budget you have available and dedicate an amount to not only the stay but some of the luxuries contained. It’s not all about just resting your head. If there is a mini-bar then why not enjoy yourself – Keep it professional, mind you! 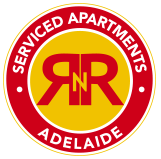 For the perfect corporate apartment, look no further than RNR Serviced Apartments Adelaide. We have a wide range of self-contained serviced corporate apartments available in Adelaide CBD, which we know will make your stay so much more enjoyable. Why not give us a call today on (08) 8416 4200 to find an apartment that ticks all the boxes for your travel purposes.